The CPP had lost its way, neglecting Cambodia’s population as its leaders, comfortable with their wealth and power, accumulated the “disease” and “dirt” of officials who faced little public scrutiny. 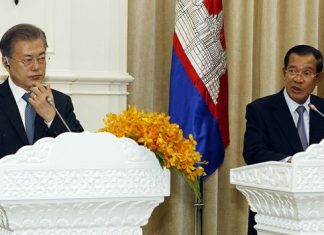 Prime Minister Hun Sen’s message, delivered in a six-hour speech on television in the aftermath of his party’s near defeat at the 2013 election, was a shock call to arms for the ruling party to reorient. 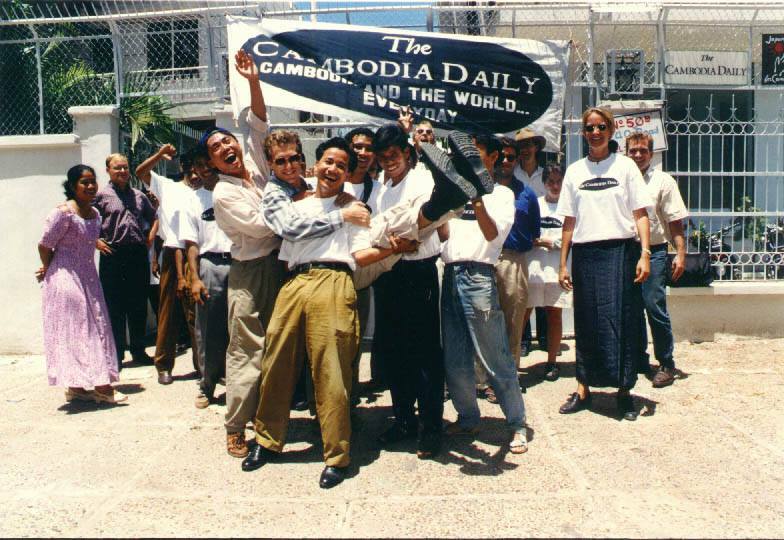 Cambodia now had a viable and unified opposition, and the ruling party needed to shape up or prepare for the people to turn irrevocably against it. “First, you need to use a mirror to look at yourself,” Mr. Hun Sen told his ministers. “Second, you have to take a bath to clean your body. Third, you have to scrub your body while bathing if it is plagued by dirty things,” he said. Yet almost three years into the five-year electoral term, Mr. Hun Sen’s party has instead spent much of its time smashing those “mirrors” as if they were the source of the ills, jailing lawmakers and rights monitors and pursuing U.N. officials and political analysts. Meanwhile, a broken health care sector has rattled along unfixed, corruption has continued to plague the public sector and hundreds of thousands of young people are streaming out of the country to find work, raising questions about what exactly the CPP has changed. It has led to a growing sense of despondency among a young population that now expects more, said Kounila Keo, a 28-year-old who just finished her master’s degree at the Lee Kuan Yew School of Public Policy of the National University of Singapore. 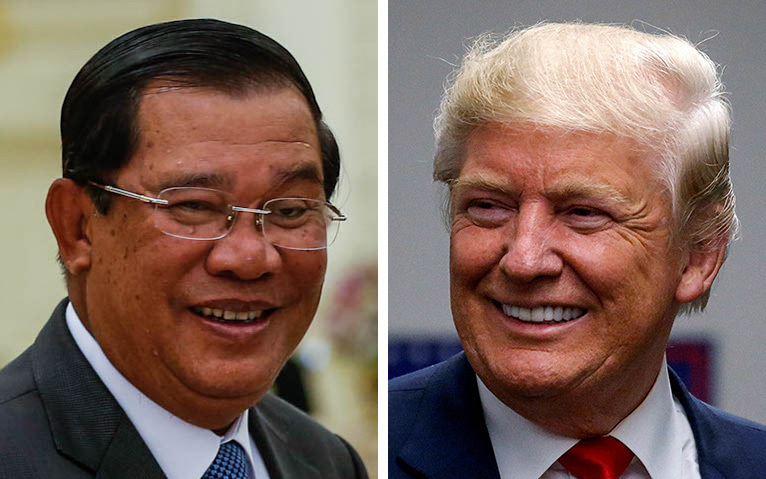 “Unfortunately, a lot of, if not all, the leaders Cambodia has are ruthless and have been unwilling to learn from the past. They are ruthless and are only interested in running the country for personal gain at the expense of others,” Ms. Keo said on Monday. “Whereas we have some good policies, there are so many venues for corruption, and so many vested interests that nothing ever gets done,” she added, saying the government still could not run basic services. Amid calls for the state to provide basic services and support to its population has been a growing paranoia by officials afraid of a “color revolution”—five more protesters were detained on Monday for gathering in black shirts. 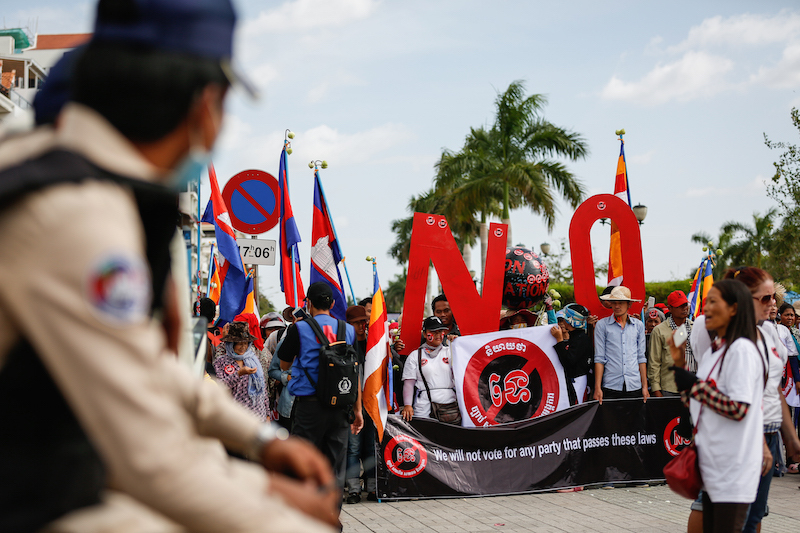 Kem Ley, a political analyst who heads the Khmer for Khmer advocacy group, said CPP officials still believed they could survive by following the old playbook where they tend to their fiefdoms while a wily Mr. Hun Sen crushes dissent. “Even if the government is starting some administrative reform, they still just think about political motivations and themselves. When they just think about their families, their sons, their children, they leave out the qualified people and cannot reform,” he added. The lack of opportunities for intelligent young university graduates born outside governing circles has not been helped by the government’s apparent tone deafness to an angry public. Last month, it was revealed that Anti-Corruption Unit Chairman Om Yentieng had given two of his sons jobs as “assistants” at the unit—leading to public outcry and claims of nepotism at the very body meant to combat such practices. Yet Mr. Yentieng, holding a press conference two days after appointments were made public, was unapologetic, challenging his critics to prove they were better than his sons. “If you defeat my sons, I will give their [positions] to you,” he said. Coming amid the ACU’s prosecution of rights monitors, an election official and a U.N. official for $204 apparently delivered to support an opposition leader’s alleged mistress, it did little to fend off questions about the anti-graft body’s purpose. Similar questions have been drawn about what actual corruption the ACU has busted since it was established in 2010 with Mr. Yentieng—who had until then been one of Mr. Hun Sen’s closest personal advisers—at its helm. Last year, Mr. Yentieng decided that a top health official who accepted more than $351,000 in bribes to dole out contracts worth $12 million to provide mosquito nets to villagers would not be prosecuted. Instead, Mr. Yentieng simply ordered the official to pay back the bribes. Chansambath Bong, a 21-year-old student in the fourth year of an international relations degree at the Pannasastra University, said some early victories for the CPP in removing corruption from the education system in 2013 had turned the heads of skeptics. “Meanwhile, corruption cases against government officials, including the Cambodian ambassador to South Korea, leads to much applause from members of public, even though some believe that the case is politically motivated,” Mr. Bong said. “On the other hand, the ACU’s involvement in [deputy opposition leader] Kem Sokha’s affair with his mistress triggers waves of criticism on the credibility and authority of ACU, as a neutral anti-corruption body,” he said. Not only that—added Mr. Bong, who said he was still an undecided voter—but many people were angered about the status of the country’s health care system. “Numbers of people, including the prime minister and his top officials, often flee to neighboring countries such as Thailand, Vietnam or Singapore for medical check up and treatments,” Mr. Bong said. “For the poor, they have no choice but to survive within the current broken system,” he added. However, Council of Ministers spokesman Phay Siphan said such concerns were overemphasized by the government’s critics, and were never raised by local villagers when government officials visited. “I have never heard them ask like that,” Mr. Siphan said of general complaints about health care services. “They ask why a doctor is not present 24 hours [in the village], or why they have no transportation, so we solve that. We make sure the nurses are in the villages, and are always available,” Mr. Siphan said. “The people, like I have shared with you, never think about going to Singapore, Thailand or Vietnam, unless they are rich and have the choice. The regular people are satisfied with what they have,” he said. The spokesman said government officials were actively dealing with the issues locals most often raise when they visit. “The real people talk about land-grabbing. They want social land concessions for cultivation, and we have local policies to make sure they have that. Then, they complain about roads and schools, and we make sure those services are provided,” he said. But while roads and schools have been the CPP’s bread and butter in past elections, with the issue of land grabbing dominating the 2013 election and helping the CNRP steal large swaths of the CPP’s former rural heartland, much has changed in three years. Opposition leader Sam Rainsy said in an email last week that the CPP was at risk of losing the 2018 national election if it ignored the people’s increasing disenchantment and pressed ahead with arresting critics. “This younger and relatively more educated segment of the population tends to look forward and not backward. It tends to compare present Cambodia not with our country under the Khmer Rouge but with Cambodia’s neighbouring countries,” Mr. Rainsy said. The opposition leader said that he recognized much of the CNRP’s successes came not from its innate appeal but because it was an alternative to the CPP, which he said had abandoned the pursuit of scrubbing itself clean. 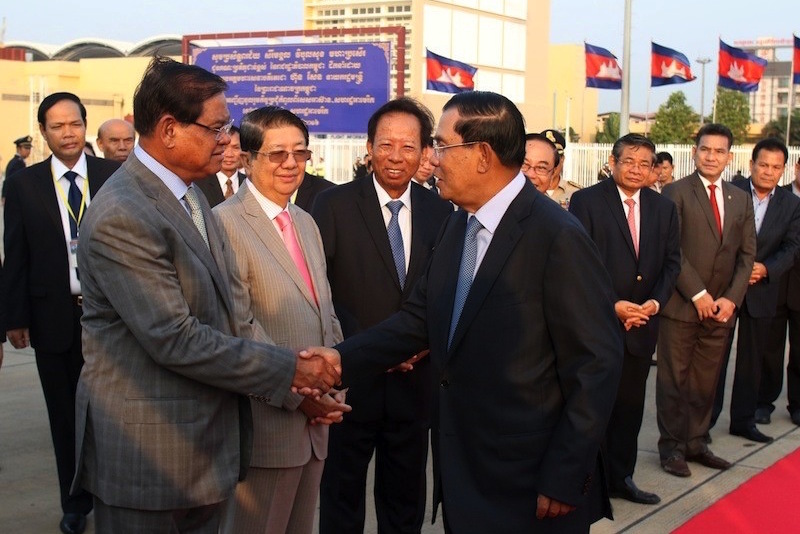 “Even if Hun Sen can break the current CNRP, there will be another CNRP that will emerge, meaning another united democratic force paving the way for Cambodia’s transition towards modernity,” he said.